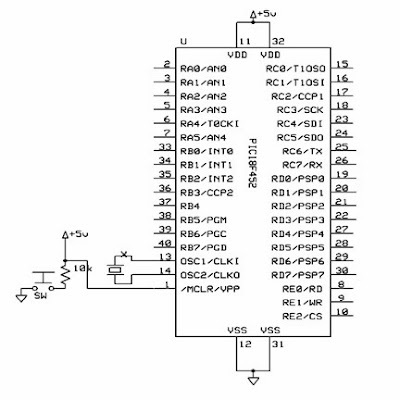 In our previous post we have seen features of Pic18f452, in this post we will look at the Pin Diagram and its general hardware connections. It is of 40pin package comprises of 5 ports i.e A, B, C, D and E .
Most of the port pins have multiple functions i.e we can note from the above pin diagram that Port A can be used as general purpose Input/Output or analog inputs and also Port B pins can be used as general purpose I/O as well as interrupt inputs. Now let us look at the general connections which will be same in all the project. Pin 1 is MCLR pin, if the Switch 'Sw' is pressed then current flows to ground and pin 1 will be '0' ( 0 level potential) by which microcontroller will be reset. If we are using +9v battery, then it has to be converted to +5v by using IC7805, we have seen it in 'Simple Light Sensor Circuit project' post. As we know the importance of Crystal oscillator from our previous posts again repeating it is the waste of time. ( I recommend your to follow my posts in hierarchy way as i mentioned in home page). I have been using this replica watch, Best Luxury watchesit is a very beautiful and affordable automatic watch, good size, great quality, elegant and temperament, is my favorite style.Best Luxury mont blanc watches I shared this website with my friends and they were very happy.